Over the years I have become known amongst the joiners, builders and furniture manufacturers in the area around where I live in Bingley, and I am increasingly being approached to do small ‘one off’ jobs for them. Of course they don’t want bowls or hollow forms or boxes or goblets. No, they want, mostly, ‘three staircase spindles to match these others that have been in the house since 1872’ (or whenever). Although I am no copy turner, nor ever want to be, I quite enjoy these jobs. There is skill, and satisfaction to be had, in making a good copy of an item originally designed by some 18th, 19th or 20th century craftsman. Where other turners aren’t interested in the ‘one off’ copying job, I regard it as an opportunity to study earlier designs which add interest and variety to the work I do. If you have that turned piece that needs repairing or copying, then why not contact me - I might be able to help. Below are some examples of the sort of job I mean. There are no big pictures of these items. I couldn't resist putting this in, if only for the advertising potential. A lady in Edinburgh emailed to ask if I could make a replacement knob for one that was missing. I explained that copying the shape was easy but getting a good timber match might not be so straightforward. "Just to let you know that the knobs arrived today and are perfect! Thank you so much for making the knob - wow! You have done a fantastic job - how clever. The wood looks identical. Many thanks for the fantastic job - I am thrilled with it!" Well, you can't say fairer than that, can you? A friend who is a craftsman woodworker himself was asked if he could repair these legs which were very old and had been literally smashed at the point shown by the arrows. The top section was in small pieces. His reply was ‘No, but I know a man who can’...and so they came to me. I pointed out that it would be a lot simpler, and therefore cheaper, to make new ones, but the owner was very keen on conservation and was willing to pay for the repair. It was quite a tricky job because the lower section had distorted over the years and was anything but round. However, they turned out well and the owner was pleased with the result. A local roofing firm asked me if I could copy a finial from a roof apex. They wanted five copies and here they are with the original in the middle. The pine will need treating to stand the weather, and it will then be painted (I assume). A very nice chap knocked on my door one wet and windy day and said he was ‘looking for a friendly woodturner’. He was renovating a boat on the Leeds-Liverpool canal and needed a binnacle making to his own specification. I know nothing about boats, but it turned out that a binnacle is a sort of steering column. It will eventually have a wheel that turns the pully, and ropes attached to it will move the rudder, thus steering the boat. Often the binnacle also carries the boat’s compass, but not in this instance. He supplied his own timber, a large piece of larch which he brought down from Scotland, and you can see the result in the photo. He seemed pleased with it, anyway. A well-formed set of pillars to make part of the railings around some decking in my own garden. My wife was very pleased with the result and they look good now they are in place and treated with preservative. Turned from pitch pine, these roof finials are around six feet long including the square section, and now grace the roof of a house in Haworth. The owner described them as ‘a proper job’, and I have to agree that they do indeed look very well. An unusual commission from a Media Productions company who wanted four 12 inch long pears for use in an animation they were working on. 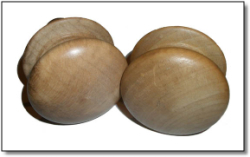 These were the first two off the lathe. I enjoyed doing them. 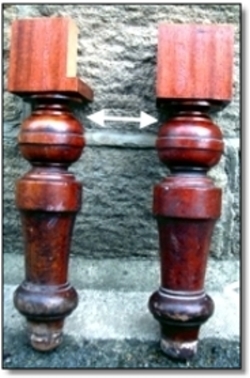 Made to the customer’s own design, these newels were to replace a pair of hideously ugly newel posts which, luckily, were damaged when the stair rails were boxed in by a previous owner. I, for one, was very happy to see the old ones go, and it wasn’t even my house! 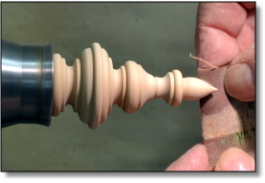 Made to match the main central finial on an antique Black Forest clock, this finial is one of a matching pair. 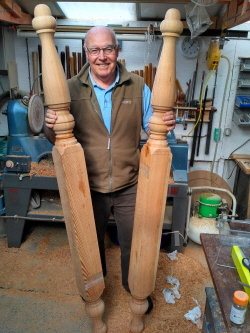 Turned from beech like the main finial, they were then stained to match the rest of the clock. The owner was delighted and confessed that the job had needed doing for at least twenty years!